Trade Stands are a great way to do business – all those happy eventers and their willing supporters gathered together! 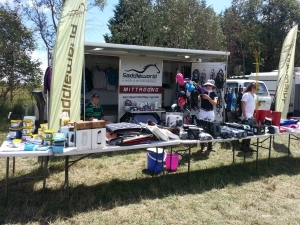 Trade Stand: A trade stand space costs $250 per site, per event (includes Saturday and Sunday) so they are great value. Every Trade Stand is offered a free advertisement in our Program for each event. We value our Sponsors! Sponsorships are as little as $300. As thanks, we offer an advertisement in our Program and your logo embroidered on our winner’s rugs. A note to all sponsors and traders: To secure your trade stand or sponsorship we require payment prior to the event. If you’d like Sponsorship and a trade stand, that’s fine, and you will be charged for each. Araluen has no powered sites, you must bring your own (quiet) generator if you need power. We’ll need your high resolution logo for your ad, please send this to us well before the event and we’ll keep it for future use! Traders need to set up and have their vehicles behind the fence before 8am on Saturday. If you can set up on Friday that’s even better. Please have any banners or signs placed before horses and pedestrians arrive on Saturday (as they often arrive before daylight!). Please contact our Sponsorship & Trade-stands Coordinator, Melissa Lamrock-George via the Contact Us page – Click here.